Crumble ground beef in skillet and brown gradually over medium heat. Drain and add to 1 jar of spaghetti sauce and set aside. Place manicotti noodles in large stockpot of boiling water. Boil until tender and remove from hot water and gently place into cold water until firm. Dry noodles on paper towel. Combine ricotta, 4 cups of mozzarella and basil in large bowl. Add 2 cups of spaghetti sauce to the bottom of 9x12 baking dish. To make filling shells easier, just split up the side, fill with cheese mixture, close and lay split side on bottom of pan. Continue until all shells are filled. 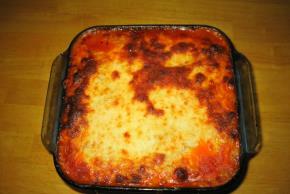 Top with spaghetti sauce with ground beef until all shells are thoroughly covered. Sprinkle with parmesan cheese. Place in preheated 350 degrees F oven for approximately 10 minutes. Remove from oven and cover with 2 cups Kraft Shredded Mozzarella Cheese and return to oven. Bake for 15 minutes more, or until mozzarella is nicely golden brown.